An online discussion forum should be an effective way of engaging students in careful and considered reflection, yet often they represent time-consuming and frustrating experiences for faculty. Getting students to share thoughts and ideas, balancing contributions and knowing when to stimulate, moderate or step-back can be challenging. I’ve long found the advice to faculty, much of it still rooted in Computer Mediated Conferencing (CMC) models of the early mid 1990s-mid 2000s, unresponsive to the context of learning and the changing nature, and expectations, of learners. It is remarkable how quickly Gilly Salmon’s Five-Step-Model (Salmon, 2000) became for the majority what Stephen D. Brookfield might describe as a paradigmatic assumption (Brookfield, 1995). The need for familiarity with the tool or context, a first-step, is itself now profoundly complex. Learners have hugely differing understandings of the function, and etiquette, ‘within‘ a given online communication tool. One of Brookfield’s lovely example of ‘hunting assumptions’ is the illustration of a common-sense assumption that to circulate around the classroom having assigned group tasks shows engagement, interest and commitment, whilst he suggests it may well be interpreted as a lack of trust and distorts learner responses to the task in hand. How quickly have we adopted Salmon’s notion of responsiveness, encouraging faculty to respond to each student posting, as common-sense, our paradigmatic assumption. Salmon herself is not to blame for this, the context of her original model had a very different digital landscape to underpin it, that notion of personal presence less well articulated, learners experiences of commenting, rating, sharing, reviewing in a myriad of different online contexts is something ‘new’. So this week, while I watch colleagues around the globe initiate MOOCs and discuss global OER standards, I set myself a more modest task. I wanted to explore what we thought worked well in online threaded text-discussion and why there appeared to see an enduring negativity, from students and staff, about the dreaded ‘discussion board’. 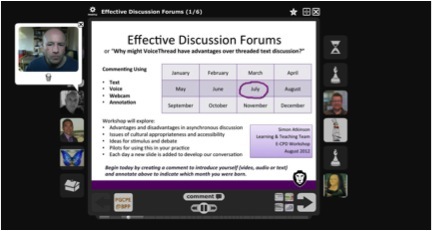 I set up a one week asynchronous online continuing professional development (CPD) workshop for faculty and learning support staff discussion effective thread text-based discussions online (we have Blackboard 7). The workshop was to run during the working week, from Monday 9am to Friday 5pm, with a ‘new’ topic added each day and an encouragement for colleagues to ‘dip-in-and-out’. What was different from our usual institutional practice was we did it in Voicethread (www.voicethread.com). A VoiceThread is a collaborative, multimedia slide-shot that holds images, documents, and videos and allows people to navigate slides and leave comments in four different ways. Users can use text, voice using their computer microphone, upload a pre-recorded audio file or capture a video on their webcam. In the US they can also use the telephone. Users can also draw on the slides while commenting, allowing them to annotate a diagram, image or schematic; they can also zoom-in to the image for more detail. Users can also create multiple identities, allowing them for instance to take on a group leadership role whilst remaining a member of the group, or adopt more playful and creative personalities. VoiceThreads can be embedded in the existing VLE or another web page and can also be archived. It is primarily a web browser based tool, now also available on iOS mobile devices and available in an accessible screen reader version or very low bandwidth version, and users have no software to install. The tool itself has strengths and weaknesses and, whilst I declare it is a tool I’ve used and evaluated previously (Burden & Atkinson, 2010), I am not seeking to promote it. Rather what I wanted to do was to take faculty away from their existing assumptions about discussion threads and have the conversation in a very different context. As we explored each day a different theme it proved remarkable how some contributions followed the ‘discussion board’ convention, whilst others playfully sought to exploit the new technological opportunities the environment afforded them. One colleague made a series of short, positive and responsive contributions in response to others, what might be seen as rather appropriate netiquette in online discussions. However, because the comments were all appended to the end of a timeline, those responses (unless clearer ‘tagged’ as such) appeared as ‘hanging interjections’ without context. 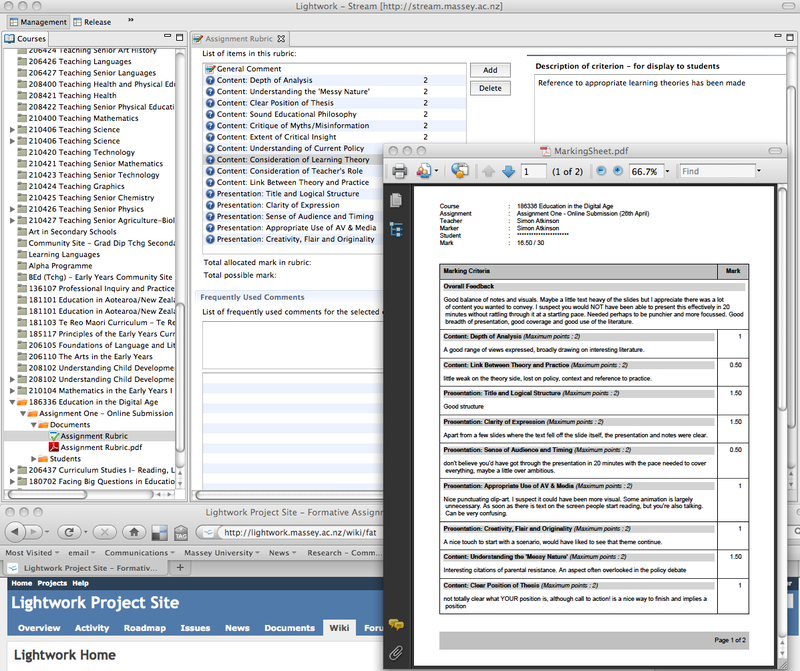 None of the 79 contributions during the week, except for my own, used anything but text which I felt was disappointing. In coming weeks I will analyse the pattern and nature of the responses in more detail, and critique my own model of facilitation in this context, but what has emerged immediately is how quickly some ‘assumptions’ have been set and are subsequently modelled even when users find themselves in a different communication context. This is perhaps one of our biggest challenges as educational technologists and developers, or instructional designers, is to recognise our quickly solidifying paradigmatic assumptions and move beyond them. The digi-ecology is in constant flux and we need to consistently challenge how we do what we do. Brookfield, S. D. (1995). Becoming a Critically Reflective Teacher. John Wiley & Sons. Burden, K., & Atkinson, S. (2010). De-Coupling Groups in Space and Time: Evaluating New Forms of Social Dialogue for Learning. 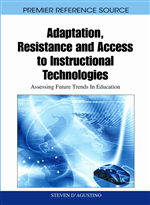 In L. Shedletsky & J. E. Aitken (Eds. ), Cases on Online Discussion and Interaction (pp. 141–158). Hershey, Pennsylvania: IGI Global. Salmon, G. (2000). E-moderating : the key to online teaching and learning. London: Kogan Page. I attended a seminar run through the London Learning Lab yesterday focused on the future of education and the implications for ethical research. You can read more about it here. By chance I came across this presentation by Helen Beetham which she gave at Greenwich University recently. It covers a vast range of issues related to digital technologies in Higher Education but a lot of what she is saying is pertinent to what we are interested in achieving with the DiAL-e framework. Have a watch and listen if you get a chance! ‘See-Sick’ in Prezi: What place for visual rhetoric? Author Simon Paul AtkinsonPublished on October 23, 2010 July 21, 2018 Leave a comment on ‘See-Sick’ in Prezi: What place for visual rhetoric? I have begun writing a paper on visual rhetoric. I sat on the 7:31 commuter train to St.Pancras and watched to commuters, hunched over their laptops, working in PowerPoint. Their screens, filled with words, varieties of fonts, and formatting tricks in abundance. These comprehensive essays in landscape, perhaps to be printed and distributed but more likely projected illegibly for a bewildered business audience later that day reminded me again of the fundamental misuse of a very powerful and effective technology. The same day I showed my wife a Prezi presentation that I was preparing for a workshop the following day. Her comment was that it made her feel seasick as I moved fluidly, but somewhat distractedly, from one block of text to another. I suggested the term ‘see-sick’. So I began to consider the power of these visual tools in our classrooms and the very superficial understanding that I, and I suspect the majority of my colleagues have, of their use. In such circumstances I often find it useful to turn to Merlot or Aristotle. Since I had no Merlot I turned to Aristotle. Aristotle, identified three branches rhetoric: judicial, epideictic and deliberative. Judicial rhetoric is concerned with justice and injustice, the defence or advocacy of charge or accusation. Epideictic rhetoric refers to speech or writing in praise or blame. Perhaps the most familiar notion of rhetoric is that of deliberative, in which speech or writing attempts to persuade others to take or not to take some defined action. Much of our teaching is the incitement to learners to do something, to take an action. Teaching may in many circumstances be considered deliberative rhetoric, an invitation on the part of the student (as reader, listener or participant) to pause and consider in response to a carefully timed performance and managed argument, the pace and rhythm control, the deliberate self interruption, punctuated silence, exclamations, questions, punctuating gestures. The teacher’s role is not simply to highlight an argument but to ensure that if a vote were cast the learner might make an appropriate judgment. Teaching in face-to-face contexts supported by presentational technologies, the ubiquitous PowerPoint or some more contemporary form of visual media, requires a new mastery of rhetoric - that of visual rhetoric. This branch of rhetorical studies that concerns itself with the persuasive use of images, in isolation or in harmony with words, is a powerful tool in the classroom. Kostelnick and Roberts in “Designing Visual Language: Strategies for Professional Communicators”, detail six canonical criteria through which to interpret the rhetorical impact, primarily of written text. These six are: arrangement, emphasis, clarity, conciseness, tone and ethos. Emphasis – differentiates elements giving some prominence through changes in size, shape and colour. Back in 2001 I did (what I still think was ) some interesting work with Nicola Durbridge at the Open University’s Institute of Educational Technology looking at how to overcome some of the restrictions of text based discussion boards, the ‘drudgery’ of CMC (Computer Mediated Conferencing). I explored a simple ‘visual metaphor’ of a classroom so that individuals posting items to a forum did so ‘spatially’ as icons rather than simply adding the posting to list. (Atkinson, 2001). I have just scanned the resulting conference paper and it is work I would be keen to extend now in looking at Prezi and its use of visual rhetoric. A Prezi that explores visual rhetoric is on its way. Atkinson, S. (2001). Re-Tooling Online. In Book of Abstracts (pp. 154-156). Presented at the Online Educa Berlin 2001, Berlin: ICEF Berlin GMBH. Kostelnick, C., & Roberts, D. D. (2010). Designing Visual Language: Strategies for Professional Communicators. Longman Publishing Group. Smith, K. L. (2005). Handbook of visual communication: theory, methods, and media. Routledge. Published on October 23, 2010 July 21, 2018 Categories Thoughts, Idle and otherwise, Tools and TechnologyTags powerpoint, presentational design, prezi, rhetoric, visual rhetoricLeave a comment on ‘See-Sick’ in Prezi: What place for visual rhetoric? How is VoiceThread changing our ideas about communication? Kevin Burden and I gave a short paper at ASCILITE in Melbourne Dec08 called "Evaluating Pedagogical ‘Affordances’ of Media Sharing Web 2.0 Technologies: a case study". In the paper we looked particulalry at how the DiAL-e Framework might be used to explore the opportunities of a particular tool, in this case Voicethread. Off the back of that we bagan to get rather interested in how the various Web 2.0 technologies are actually chnaging the way people think about communication. We're writing that up now and part of the process is to use the tool to talk about the tool! So Kevin has created a VoiceThread called "How is VoiceThread changing our ideas about communication? " I've embedded the VoiceThread below. It's free to sign up and make contributions. Although we're looking for people to share their existing expereinces, the novice perspective is also welcome. Making comments is really simple and you can delete and re-record as many times as you like. A VoiceThread is an online media album that allows a group of people to make comments on images, videos, and documents, really simply. You can participate 5 different ways - using your voice (with a microphone or telephone), text, audio file, or video (with a webcam). It's easy to control who can access and comment on a VoiceThread, which makes it a secure place to talk about almost anything: business and academic presentations, travelogues, family history, art critiques, language study, tutorials, book clubs and digital storytelling. A VoiceThread allows an entire group conversation to be collected from anywhere in the world and then shared in one simple place. So here's our invitation to a dialogue ! How is VoiceThread changing our ideas about communication?